The new ZWO ASI183 Mono has lots of astro photo potential with its 84% QE peak, 20.18 Mega pixels resolution, 15000e full well, 1.6e read noise, 19FPS at full resolution. Each feature means a new posibility! Although comes with some similar features, don't be confused, this is not to replace the already well established ASI1600 series; read the below article to get a better understanding of its main area of "expertise" and see if it is the ASI183 or ASI1600 that would fit your telescope setup better. Shortly, this camera would very well fit small, fast ED doublet or triplet apochromats, achromates and small, fast Newtonian telescopes. Introducing the ASI183 camera series, the most sensitivie cameras in ZWO history. Peak Q.E. of the mono sensor reaches 84%! In the astronomic application field, the Sony IMX183CLK-J (monochrome) and IMX183CQJ-J (color) sensors use a very high sensitivity back-illuminated structure with high resolution 2.4 μm square unit pixel. 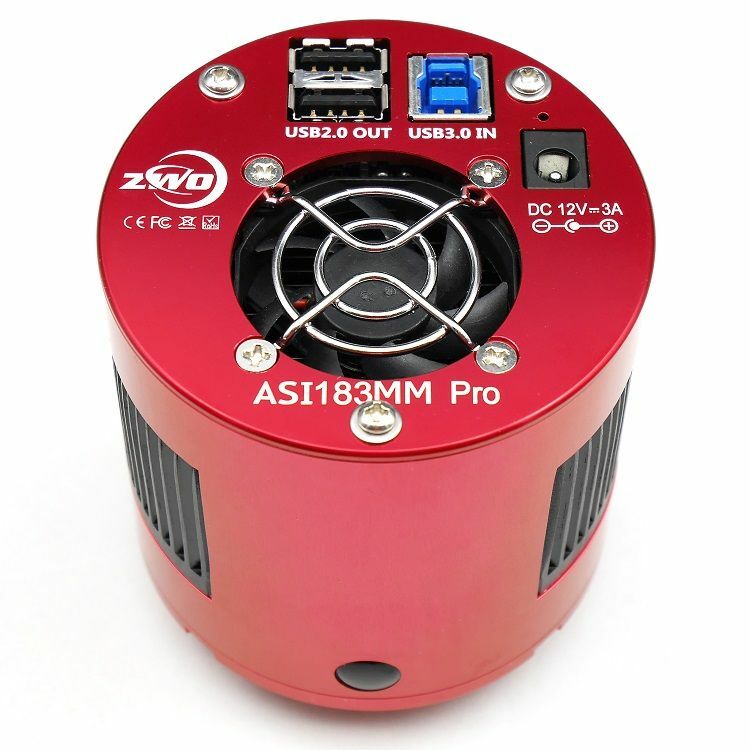 The ASI183 Pro camera includes a 256MB DDR3 memory buffer to help improve data transfer reliability. Additionally, the use of a memory buffer minimizes amp-glow, which is caused by the slow transfer speeds when the camera is used with a USB 2.0 port. 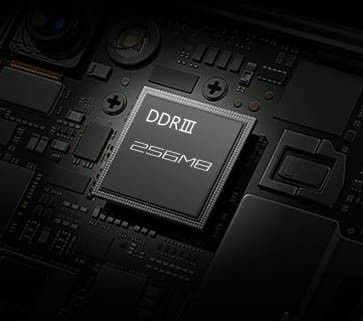 In addition to few minor mechanical differences, the DDR memory buffer is the main difference between ASI “Cool” and “Pro” cameras. The ASI183 cameras has a very large full well capacity（15000e） for such small pixel size, 1.6e read noise @ 30dB and 12stops dynamic range @ Gain=0. 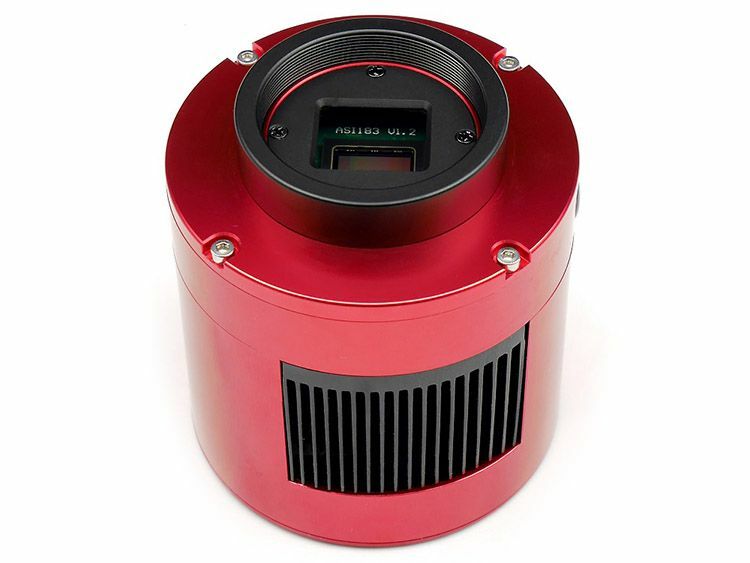 The ASI183 cameras also utilize firmware features to minimize amplifier glow for maximum performance in astrophotography. ASI183 Pro has same mechanical construction as the ASI1600 PRO. There are four screws that seal the sensor chamber. Our camera design has been extensively tested and is very reliable. Even when used in high humidity environments, the ASI183 PRO will still work fine without dewing up problems. Fast FPS can be used in solar and lunar imaging, as well as for live viewing/EAA.The high speed readout may also be used for real-time focusing, true lucky imaging of double stars and other small objects, planetary imaging of the major planets in the solar system, and much more. Sony’s back-illuminated Exmor R technology, giving it excellent Deep Sky performance. ASI183 QE peak reaches a remarkable 84%. In Ha channel, QE is still over 60%. Having high QE means more of the light that enters your telescope and reaches the sensor is actually used. With 84% peak Q.E. and no less than ~50% within the visible spectrum, the ASI183 will utilize a high percentage of the light that reaches it, improving your signal quality. The dark current of the ASI183 is extremely low, based on our test results. USB 3.0 Port: Provide 5Gb bandwidth to make it possible for ASI183 Pro to run at 19 fps (12bit, normal mode) or 19 fps (10bit, high speed mode) at full resolution(20.18Mega). Recommended cooler power supply: 12V @ 3-5A (or more) DC adapter (2.1×5.5mm, center pole positive). Also suitable: DC battery with 9-15V. Using a battery with 9-15V is also suitable for the cooler power supply. 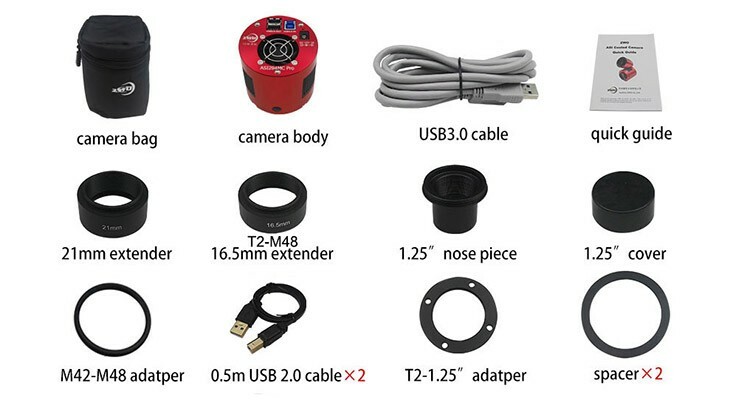 USB 2.0 HUB: can connect with various accessories, such as filter wheel, guide camera and electronic focuser, so you can better manage your cables. The ASI183 Pro includes two short 0.5m USB 2.0 cables. The integrated USB 2.0 hub is powered by the external power source if you connect one. The ASI183 box includes all necessary cables, adapters, and manuals. Notice: Cooled cameras need a 12v power adapter, If you don’t have one, please click this link to buy a 12V power adapter.